Did you know your body has approximately 640 muscles? In any given moment we have access to millions of voluntary movement combinations; the movement combinations are endless. Miraculously, our bodies work, and they work incredibly well for how much information is being passed and managed from mind to muscle. Just like our bodies, email messages also have a large number of moving parts (luckily far fewer than 640+) that need to be toned and strengthened (or optimized) over time. By focusing on the muscles of your email marketing campaigns, that is, the components of an email message and by systematically testing and honing each to maximum efficiency, we marketers can make the most of our email campaign investments. But before we can give our email marketing messages a workout, we have to understand the components available to us. Let’s examine each email marketing message muscle to understand what levers comprise a well-designed email message. The sender name or from line is the outward facing name subscribers will see and can be considered the mask for the reply-to email address. Always make the sender name something relevant and specific. From lines such as info, news, admin, sales, etc. will likely depress conversion rates and miss out on the opportunity to build a more human relationship with your subscribers. Avoid generic names at all costs. If you are an ecommerce site, it is appropriate to list your website name as your sender name (e.g. UrbanOutfitters.com above). If you are not an ecommerce site, avoid. Why such intrigue with email subject lines? 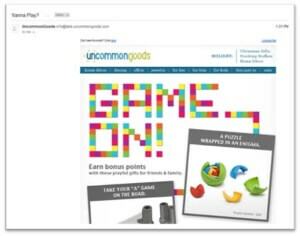 Email subject lines are, in tandem with the sender name, an email’s only hope for being opened. It’s your first impression, your hook, your very own mini-billboard. descriptive – Be upfront and forthcoming. Tell subscribers right away what the email is about. 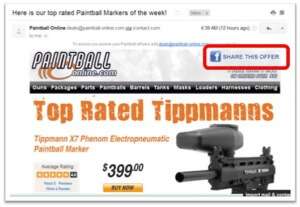 compelling – Take advantage of your billboard and tell subscribers why they should open your email. personal – Be yourself and personalize. Show your company’s personality. Subject lines are a like a pickup line, you have one chance to hook your subscriber (don’t blow it!). Personalize whenever possible (more on this below). concise – You have limited subject-line real estate. Be economical and clear with your languages. (Again, more on this below). Aside from these general qualities, here are more specific best practices every email marketer should employ. Subject Line Length (SLL) Another oft-discussed topic is subject line length (SLL). The rule of thumb is straightforward: limit your subject line to 50 characters or less as subscribers see only the first 38-47 characters. Use your common sense and do your research before sending a subject line that may be blocked by spam filters. Case Be careful when using excessive or repeating punctuation and capitalization. This can cause you to be blocked by spam filters. 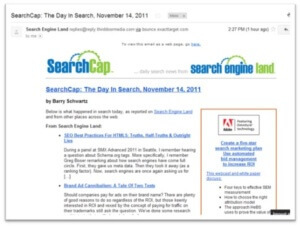 Test, Test, Test Always a/b test every subject line, measuring the conversion rate of each. Strengthen this muscle as it will become your very best friend in maximizing your campaigns’ ROI. 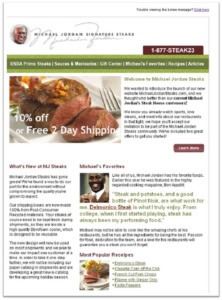 Here are some email marketing ideas to get your creative juices flowing. 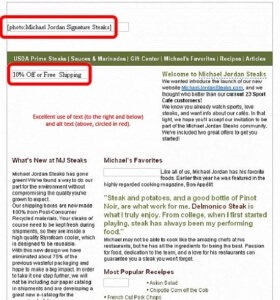 Front-load your subject line with a CTA, brand name, or buzzword. If you’re sending a content-driven message (e.g. an email offering a whitepaper or download), research suggests that longer subject lines work best as long as there is the subscriber is primed up front by a front-loaded subject line clearly stating what’s available to them in the email. 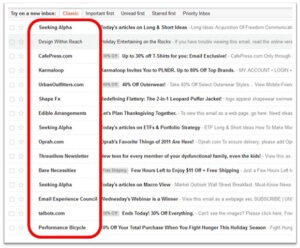 If you are stuck on a subject line, use the Digg method. Go to Digg.com search your topic and look at the articles that got the most Diggs. These subjects generally have high click-through and are extremely viral. You’ve made an excellent first impression at this point. Your subscriber has successfully been wooed and has opened your email. What do they see now that they’ve passed the first threshold? Include a link to the hosted version of the email (most email service providers can automatically generate a hosted version and insert this into your pre-header). Link to a “lite” version for subscribers viewing the email on their smartphone. Include a brief message suggesting that they add you to their address book (lessening the likelihood that your email will end up in their spam/junk folder). 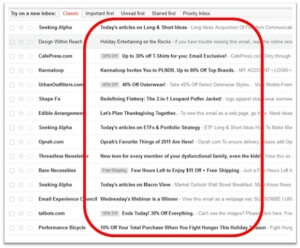 Include a CTA (see Norm Thompson example above) in the header which is both convenient and a hedge against the chance that the email does not render or is not opened. 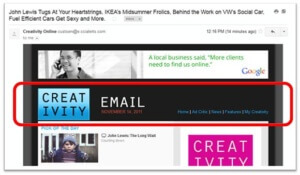 Moving from the pre-header to the header, the header is the first part of your email’s content. It’s the part of your email template that does not change from email to email (and generally only changes across email message types or campaigns). As you can see, an email header is much like the base template for your website-it includes the navigation, logos, and other content you wish visitors/subscribers to see consistently across all touch-points in their experience with your brand. 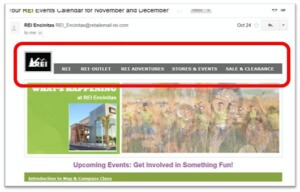 Include navigation in your email that mirrors (at least in part) the navigation on your website. Navigation is not only practical and helpful for your subscribers, but it also results in useful data. 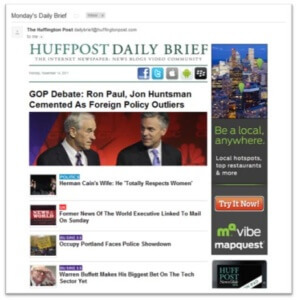 Click data can be mined to segment your subscribers. Say, for example, that 1/3 of subscribers click on men’s shoes, 1/3 click on women’s handbags, and 1/3 click on the sale section. You can then begin to build profiles around these segments after seeing this kind of click behavior repeat over time. 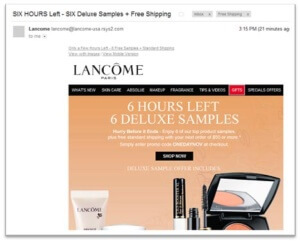 These segments can then be sent more highly targeted emails or promotions at other points in your funnel(s). Always include some kind of link through to your website! An email should never be sent in isolation with no way to allow the subscriber to navigate through to a landing page, micro-site, or your full website. Again, while there may be best practices, there is no substitute for a/b testing. Test, measure, optimize, and repeat. Once your subscriber moves past your storefront into your store, the heart of your email, your content and images, you’re on the line to deliver what has been promised thus far in your short courting relationship with your subscriber (from sender name to header). As is true with most email marketers, your email campaigns naturally result from strategic email marketing campaign born out of unique content you believe is relevant, useful to your subscribers, and useful to you (that is, it results in a referral, assists in driving retention rates, or results in revenue). Share content that is relevant; no faux spamming as we like to call it. If you have nothing to send to your users, we suggest taking a closer look as it’s likely an opportunity has been overlooked. Even if the subscriber takes no action with your email, the mere fact that you have provided them with relevant content adds a token of trust and care that over time subscribers notice whether they state this explicitly or not. Test long copy vs. short copy. There are cases in which long copy increases conversion rate and other cases in which the opposite is true. Begin by mapping the funnel you anticipate your subscribers moving through and if the funnel requires substantial information or evidence upfront, then begin with long copy. We cannot reiterate enough the importance of testing-while there are email marketing best practices and benchmarks, the data ultimately says test, test, test! As described in the section “Context and Design,” make sure your navigation’s look and feel mimics or is related to the look and feel of your website or landing page(s). 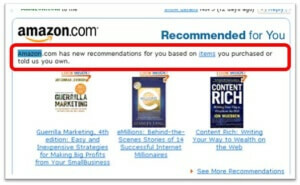 Do not assume that you need list every navigation option available on your homepage. Instead, consider the content of the email message and the conversion funnels behind each message. What action(s) do you want subscribers to take? What information do your subscribers need in order to take this desired action? 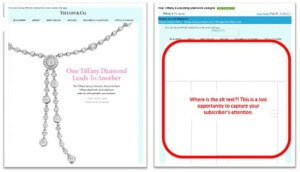 Provide subscribers with links to the next step in their conversion funnel. Remember to include seasonal / time-sensitive links when appropriate. 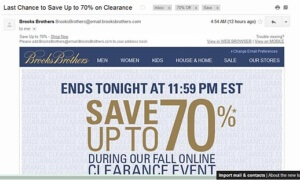 For example, if you have an annual clearance sale, add a “Clearance” link to your email message’s navigation during this time period, highlighting it using color contrast, size, and positioning. Or if you are an ecommerce site with holiday-specific categories (e.g. Valentine’s Day gifts), include this holiday category in the navigation of all related email messages leading up to this holiday. Don’t forget to mine your click data! Once your sends gain momentum and your subscriber base grows, support your campaigns by strategically designing navigation in order to produce insightful click data. Which one is best? All of them are the best. Each serves its own strategic purpose and has taken into consideration the content offered, the brand’s attributes (those outside of the email message-the site, offline advertising, the personality of the company), and the conversion funnels of concern. Okay, okay, we know it can be tiring to hear the answer, “It depends,” so we’ll pin down some best practices here for you to apply to your email marketing messages. Present your content in a professional manner and maintain your brand identity throughout your email campaigns. This is, after all, your coffee date with your subscriber (as you can see, we’ve moved from courting to dating our subscriber). The goals of maintaining a professional appearance include building and maintaining trust, credibility, and your position as an expert in the space. Never ever skimp on email design! Preview pane optimization – take note of the average size of the preview pane for various readers and optimize accordingly. The preview pane is the window someone sees without having to click on your email to open it. This can be likened to the concept of “above the fold;” place content of value where it can be seen in the pane (and above the fold once opened). As a general rule of thumb, keep your email message to no wider to 550 or 600 pixels and a height of 300 to 500 pixels (preview panes vary widely in pixel height). The cousin of the pre-header, the footer is critical for compliance reasons and for user-experience reasons. A footer is generally automatically generated by your email service provider; if it is not, make sure to include this requirement at the development stage. A footer should always include the items below as required in CAN-SPAM (full details can be found here: business.ftc.gov/documents/bus61-can-spam-act-compliance-guide-business). Take this very seriously; if you do not include these items you will likely be blocked from reaching your subscribers and your domain or other unique identifiers associated with your send may be flagged by the major email readers (e.g. AOL, Yahoo!, Gmail, etc.). An unsubscribe link and instructions on how the subscriber can opt-out of your email list. Include a contact email in the footer, especially if your reply-to email address is a noreply@domain.com email address. 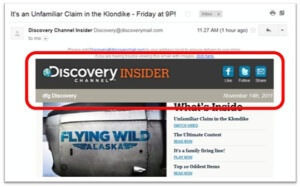 Every email you send should automatically be converted to a version viewable in a browser (a hosted version). Your email service provider should automatically create and link to a hosted version of your email message. In the event that this is not the case, make sure to ask your designer and developer to insert this into your email messages. If you can, also include a link to a lite version also hosted and viewable a browser. The lite version should be designed to allow those on smartphones to click through and view a readable, easily digestible, well-organized email message. This is typically not a service provided by your email service provider and must be completed at the same time as you are producing your standard email message. Similarly, include a link to a “lite” version for your smartphone viewers if it is available. To read more on the SEO value of the hosted versions of your emails, visit the eBoost Consulting article, “Get Free SEO Links Just for Hitting Send”. 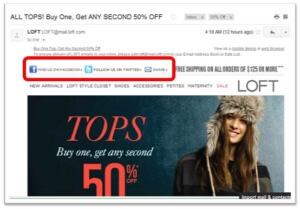 A well-designed email allows invites your subscriber in through your storefront window, into your store (your email), and then allows them to reach out to friend to share how amazing their experience is with your or to share the cool discover or learning they just had while in your store (your email message). Forward-to-a-friend functionality integrates social media into your emails. Include more basic, non-social media forwarding abilities. Forwarding to a friend can also occur through an email message. Below is an example. While not truly part of an email message, setting yourself up for success in your newly established relationship requires careful consideration of both new subscribers and inactive (dormant) subscribers. There are several key terms you need to know as an email marketer in order to obtain and maintain the highest quality email list possible. Opt-In An opt-in or subscription occurs when a person submits his/her email to a company, website, or individual, thereby giving them permission to send them email communications. Single Opt-In Also known as an unconfirmed opt-in, this is an email subscription process in which a person submits his/her email address to a company, website, or individual and in turn receives an email confirmation of their subscription at the email address provided. No action beyond is needed by the new subscriber beyond initially entering his/her email address. 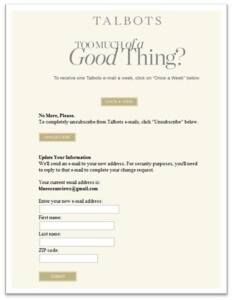 Double Opt-In Also known as confirmed opt-in, this is a more stringent method of confirming email subscriptions. Here, a person submits his/her email address to a company, website, or individual and in turn receives an email asking them to confirm that they do indeed wish to receive your email communications by providing a unique link which, when clicked, allows your email service provider to know that this person has not only subscribed, but also confirmed their subscription. 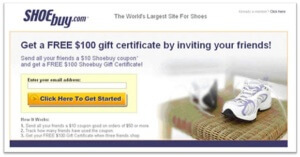 We strongly encourage (and at eBoost, require) all email marketers to employ this method. Opt-Out To opt-out or unsubscribe means the subscriber lets the company, website, or individual know that s/he no longer wishes to receive email communications. This ties back to the CAN-SPAM compliance measure: always include an unsubscribe link in your email footer. Deliverability – If you begin to send to email addresses that do not wish to receive your email communications (whether because of human error or person A subscribing person B to an email list without their knowledge, or other reasons), your deliverability rating will likely decrease as a result of increased complaints. ROI – By removing those who do not wish to receive your messages, your time and money are better spent engaging with those who do with to receive your email messages. You also reap more rewards from cleaner data as a result of including only interested individuals in your data set. Reputation – Also related to complaints, the more messages your subscribers mark as spam or submit complaints about, the greater the chance of ruining your credibility, not only with the public, but also with email readers (e.g. AOL, Yahoo!, Gmail, etc.). Each muscle of an email marketing message carries its own weight, purpose, and functions. Each one can be strengthened (that is, optimized) over time to produce maximum efficiency and the highest ROI for your efforts now and in the future. Although we have reviewed the core components of an email marketing message, it would be irresponsible of us to not point you in the right direction for next steps on learning how to create successful email marketing campaigns.